Gartner has released its report on mobile phone sales in the third quarter of the year and it shows smartphones continue to outsell featurephones for second quarter in a row. On a global scale, smartphones sales reached 250.2 million, taking up 55% of all cell phone sales. That's a 45.8% increase over the same quarter last year. Overall, phone sales totaled 455.6 million units, which is also higher than Q3 2012 albeit only by 5.7%. According to Gartner, the region that saw most of the rise for both smartphones and feature phones is Asia/Pacific. There, the smartphone segment grew by 77.3% on a yearly basis, while featurephones marked an increase of 11.9%. The other notable regions that saw a rise in sales of smartphones were Western Europe, North America and South America. As far as phone manufacturers are concerned, the only notable change from the previous quarter is the rise of Lenovo to the third spot. The Chinese company now has a 5.1% market share for Q3 2013, 1 point higher than the same period of 2012 and enough to push LG to the fourth spot. In fact, LG came only 800,000 units short of its rival and the Koreans will certainly try and catch up in the holiday quarter. Samsung's market share for the quarter remained unchanged from Q3 2012, but grew by 0.4% compared to Q2 2013. Things aren't so bright for Apple, though. The company's market share continues to slide. From 18.8% in Q2 2012 it fell to 14.3% a year later, and even the launch of iPhone 5s and 5c in the third quarter couldn't help another fall to 12.1% with a total of 30,3 million smartphone sold. Android just keeps on growing and its market share now stands at 81.9% or just about 205 million smartphones. That's a rise of 2.9 percent points compared to the previous quarter and nearly 10 percent points from the same period of 2012. Microsoft's Windows Phone operating system too saw an increase in its market share. It climbed 0.3 points in the last quarter alone and 1.3 points YoY, and is twice as big as the BlackBerry OS slice. 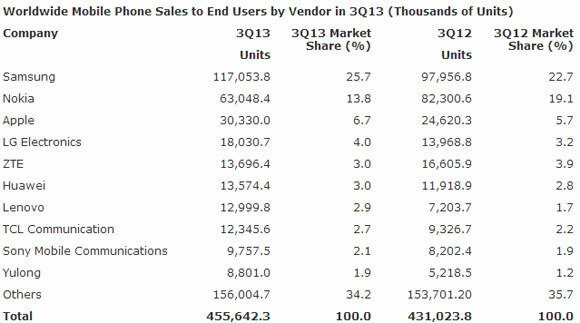 The success of Windows Phone is largely due to Nokia performing better than anticipated in Q3 2013. Gartner points out that the Finns owe their success to the expanded Lumia portfolio, but that fierce competition from Android has prevented Nokia from making a more significant impact in markets such as China. In overall mobile phone sales (featurephones and smartphones) Samsung leads with 117 million units and a 25.7% market share. Nokia is a distant second with 63 million units sold and a 13.8% share, while Apple is third with a 6.7% slice. Gartner analysts predict global mobile phone sales are on a track to reach 1.81 billion units in 2013 - 3.4% increase from 2012. Make room for me on the Nokia bandwagon! !I really like Nokia and im really happy that they are starting to become relevant again.I must admit it'll probably take a while but for sure Nokia will be on top again.